If you're watching your weight, caffeine-containing green or black tea, both from the plant Camellia sinensis, is your best bet. Tea contains caffeine and antioxidants that may boost weight loss efforts -- and tea has an array of other health benefits, too. Regularly drinking tea seems to decrease levels of "bad" cholesterol, lower your risk of heart disease and some cancers and increase insulin activity. Different teas contain different levels of these health-promoting components. Choosing the right tea can complement a well-rounded diet to help you lose more weight the healthy way. Black tea is the most popular kind of tea, and one of the most common beverages enjoyed worldwide. It appears to offer potent weight-maintenance benefits. A 2009 review in the academic journal "Eating Behaviors" concluded that regular tea consumption is linked to less weight gain over time. The authors noted that this effect was only partially due to caffeine content; other components in the beverage also influence body weight. Green tea has a high concentration of the antioxidant catechin, which may promote weight loss. According to a 2011 study in "The Journal of Nutritional Biochemistry," intervention studies have shown that drinking 270 milligrams to 1,200 milligrams of catechins from green tea daily may reduce body weight and fat. One 6-ounce cup of brewed green tea has around 235 milligrams of catechins, so you may need to drink multiple cups daily to boost your weight-loss efforts. Brewing your own tea is superior to purchasing bottled or processed tea. 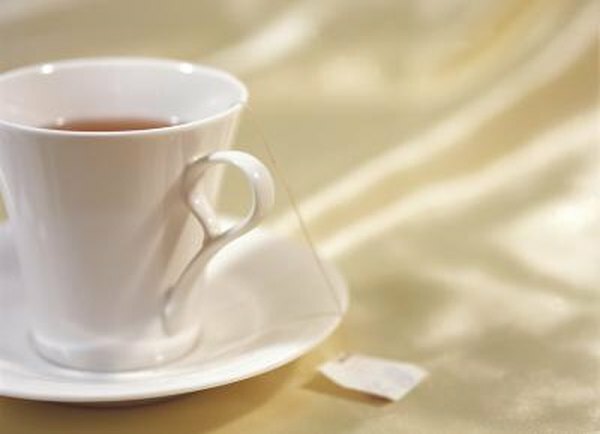 Many store-bought teas contain calories from added sweeteners, which can thwart your weight-loss efforts. These processed teas are also lower in antioxidants and other health- and weight-loss-promoting compounds. According to the Harvard Women's Health Watch newsletter, processed teas have fewer catechins than freshly brewed tea. Steep tea for 3 to 5 minutes to fully bring out the catechins. Substituting unsweetened brewed tea for high-calorie beverages like lattes, soda, juice and smoothies can save you hundreds of calories. Cultivate a taste for unsweetened tea: adding a tablespoon of sugar to tea contributes around 50 empty calories to your diet. Include tea in your healthy diet rich in fruits, vegetables, whole grains and lean proteins for optimum health during weight loss. If you're sensitive to caffeine, opt for decaffeinated varieties. They're still loaded with desirable catechins and antioxidants and won't cause caffeine-related side effects such as difficulty sleeping or stomach upset.